Germantown is a neighborhood that is rich in historical landmarks, particularly those dating back to the early 18th century. One of these landmarks is Historic RittenhouseTown, not to be confused with Rittenhouse Square, which is located in Center City. The town was the location of the first paper mill in North America, which was also the home of William Rittenhouse. Rittenhouse Square was named after his son, David Rittenhouse, who was born and raised at the Rittenhouse Homestead and Paper Mill. Historic RittenhouseTown consists of six historic buildings, one of which is the second-oldest building in Philadelphia that is still in its original design. According to Chris Owens, the director of Historic RittenhouseTown, the Rittenhouse Homestead looks the same way that it did in 1707. “I always tell visitors that if the Rittenhouse family were to see the homestead, they would recognize it immediately.” As for the other five buildings in the town, they have not stood the test of time as well as the homestead. In 1984 Historic RittenhouseTown Inc. was created by individuals who sought “to preserve, restore and historically interpret” RittenhouseTown. Their group took on the job of preventing further deterioration of the town and providing an educational experience for the community. When Historic RittenhouseTown officially opened its doors to the public in 1986, paper-making workshops were provided to students from local schools. Community events were also set up to allow visitors to come and enjoy the town. These educational programs and community events are still present today at the historic site. Ariel Wilson, the director of educational and program development, has been working for Historic RittenhouseTown Inc. for about four years. She helps organize and coordinate both the educational workshops and community events for the town. 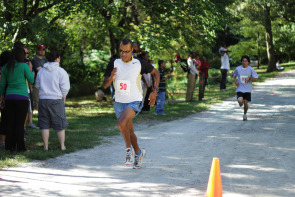 On Saturday, Sept. 11, 2010, Wilson organized the 21st Annual Paper Mill 5K Race at Historic RittenhouseTown. It was her fourth time managing the race, which attracted over 200 runners this year. Director Chris Owens said that this was by far the largest number of participants to date, perhaps drawn in by the chance of meeting the Philadelphia Phanatic at the starting line. “The event went really well, actually. It went very smoothly thanks to our new timing company, [Fast Cat Sports],” said Wilson. Not only was there a new score keeper, but there were some great sponsors, including Vita Coco and Penn Maid. They gave out free Coconut water, string-cheese, and yogurt to the runners at the finish line. Two participants that were in the race, Jonah Wilson and Joseph Renieri, thought that the event was a great turnout. “It was put together very well, but I would have liked to place better. I placed 43rd out of I think 183,” Wilson said. Renieri placed 63rd , but was satisfied that he had beaten his previous time of 33 minutes by almost six minutes. He enjoyed running in the event, even with 182 people racing to the same finish line. “I run all the time, but I never get to run with other people. So I wanted to see how well I could do,” said Renieri. According to both Owens and Wilson, this year’s race was a big success. The Jacob Rittenhouse Home is one of the six buildings at Historic RittenhouseTown. All proceeds from the Paper Mill Run 5k Race will be going to the restoration of this historic building. For more information about upcoming events, educational and public tours, at Historic RittenhouseTown, please visit the website at rittenhousetown.org. This article was written and reported by Lisa Wilk for Philadelphia Neighborhoods, a publication of Temple University's Multimedia Urban Reporting Lab, and originally published on September 17, 2010.